Skyrim Special Edition players will soon get an all new Survival Mode, Bethesda Studios announced on its website. This is basically a mod for Elder Scrolls V: SE, which ups the difficulty of the game with new features and challenges of the gameplay in to a cold and harsh wilderness. The Survival Mode will have various new factors such as hunger, fatigue, cold, warmth, Freezing water, disease, afflictions. Hunger occurs over time like in real life, and will impact your total stamina and ability to attack with weapons. To restore it, you have to eat food, and eating enough grants a Well Fed bonus. Cooked food will restore more hunger, than uncooked food. Also eating raw meat can cause food poisoning, which can prevent benefits from food. You can use fire salts to cook hot soup, which can restore warmth and prevent you from being affected by cold. Fatigue decreases magicka, and in turn affects the effectiveness of potions, and later on your stamina too. To heal, you must rest in a bed. The well rested bonus is only available when you sleep indoors. If you sleep outdoors, you may wake up Drained. Skyrim's frozen landscape can literally affect you now, with the new Cold factor. Travelling in rain and snowy areas increase cold, which will decrease the total health, and later on the movement speed, and ability to use bows, pick pockets, and pock locks. At the highest level of cold exposure, the character will die. To prevent cold, you can use fires, eat hot soups, move to warmer locations, or use a torch. Warmth prevents cold, and is provided by armor and clothing, the rating of which varies. Vampires and Werewolves can use their transformed form to slow the impact of cold, and feeding sates their hunger. 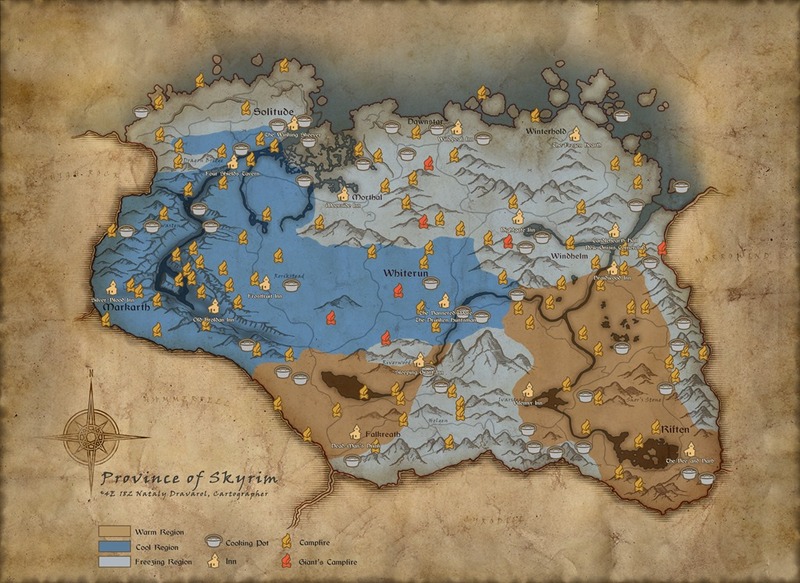 Here is a map of Skyrim, where you can see which places are cool freezing, warm, and where to find cooking pots, inns, and campfires. Creatures now have new diseases, while previous diseases are now more powerful. Failing to cure a disease may make it worse over time. Speaking of which, Shrines no longer cure diseases for free, and now require a gold offering. This only appllies to Shrines which are outside your home, those in your home can be used for free. Afflictions depend on how long you are unwell, though they can be cured like diseases or eventually wear off. Being weakened affects blocking with a shield and melee weapon attacks, while Addled affects enchantments and spells. Frosbitten is explained in the Cold section above. The Extra Pockets perk and Standing Stones perk now grant 50 extra carry weight, instead of 100. Carry weight has been reduced significantly, which will result in being over encumbured. This in turn drains stamina drastically, and will cause fatigue faster. Arrows and lockpicks which previously had 0 weight now have weight. So you will need to manage your inventory in a smart way. Fast Travel and Health Regeneration have been disabled, so you have to either travel by foot or horseback, or use carriages and boats at the risk of being affected by cold, hunger or fatigue, and to heal you must rely on restoration spells, food and potions. 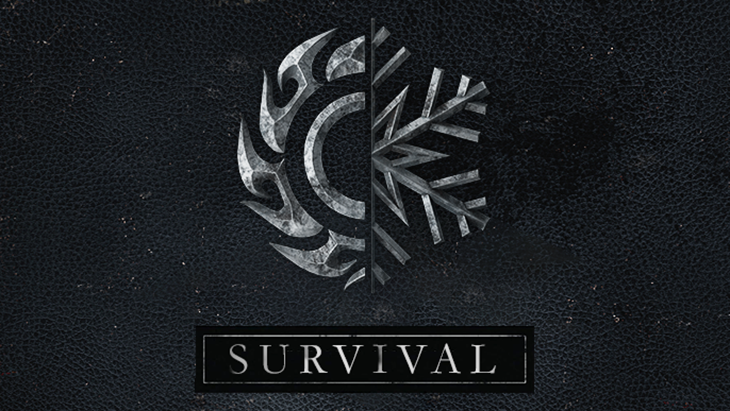 Skyrim Special Edition Survival Mode will be released for PC and PS4 in the form of a DLC. This will be a paid DLC, but Bethesda says that the Skyrim Special Edition Survival Mode content will be free for a week for both platforms. So, if you get it during the free period, you can keep it forever. You can opt on to the Bethesda Creation Club beta from Steam, by right-clicking on the game’s listing in your library and selecting the beta. The new mode will be released next month. Skyrim Special Edition Survival Mode will be free for a limied time.